Welcome to the home page for the book Java Programming on Linux, published by Macmillan Computer Publishing. We're here to help you get the most out of the book by providing current information, updates, links, downloads, and errata. 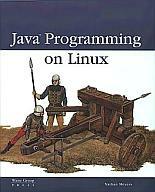 Java Programming on Linux is the first and, to date, only book devoted to the topic of using Java on Linux. You'll get some introduction to both technologies, but we're not out to duplicate the many fine Java and Linux books already out there: this book is unique in focusing on how you can use the two together. You may be surprised at how many options you have for developing and deploying in Java on Linux. For more detail about what you'll find between the covers, take a look at the organization of the book. The 907-page book is published under Macmillan's Waite Group imprint, ISBN #1571691669. The book comes with a CD-ROM, providing free software by the author and a free, advanced Java integrated development environment, Inprise JBuilder3. You'll find, at the bottom of this page, some bookstore links through which you can purchase the book online. Nathan Meyers spent 20 years in the corporate software trenches, as a developer and architect for Hewlett-Packard Company, working in handheld calculators, UNIX workstations, and inkjet printers. His experience includes development of embedded systems, device driver implementation, creation of development tools, definition and implementation work on the X Window System and the Common Desktop Environment, development of 2D and 3D graphics applications, UNIX application performance tuning, design of evolutionary algorithms, and implementation of financial algorithms. Nathan left HP in 1999 to pursue other opportunities in the worlds of Linux and Java. Besides books like this, he has published in the Hewlett-Packard Journal, The X Resource Journal, and the Linux Journal. You can see his full resume here. Nathan can be reached by e-mail at nmeyers@javalinux.net. Read about the 14 sections that make up the book to discover, in more detail, the areas covered by the book. As errors are discovered or material goes out-of-date, you can come here for the latest corrections and updates. You have an ever-growing choice of sources for Linux ports of the Sun Java Software Development Kit. This page lists your options. Come here for copies of the author's free software from the CD-ROM. This is the online, updated version of Appendix C.
This is the online, updated version of Appendix D, with links to many useful tools not covered in the book. An interview with the author at java.sun.com. An interview with the author at Borders.com. An article on the PerfAnal tool (included with the book) at the Java Developer Connection site (free membership required for entry). Feel free to follow any of these links to another Web site that has something to do with Linux. You will end up at a site that has nothing to do with the book or the author; it may be exciting and useful, boring and offensive, or in a language you cannot read - but it's almost certain to be somewhere you've never been before.